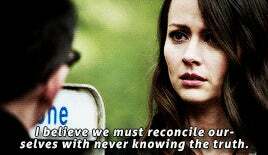 The Search for Shaw Continues on Person of Interest: M.I.A. 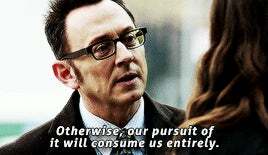 On Tuesday, Person of Interest returned to our TVs, and the search for Shaw continued with Reese and Root following the lead from the previous episode ( Control-Alt-Delete) and end up in simple looking town, while Finch helps from home base, and also asks Fusco for some help with another number. 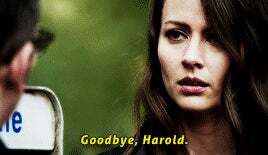 Gif-heavy spoilers after the break. Following a white truck believed to be carrying Shaw takes Reese and Root to Maple, NY, a seemingly quiet suburb that John even refers to as "Pleasantville". 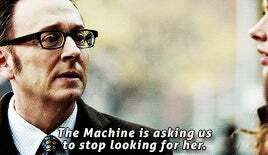 Root is anxious to find Shaw, knowing that the longer it takes, the lower their chances get. But she's still very hopeful. She mentions Schrodinger's cat, but is confident that when the box is opened, this cat won't be dead. There are only 2 ways in and out of the town, so John uses his NYPD detective cover job to see if the local sheriff can help out with survelliance footage. 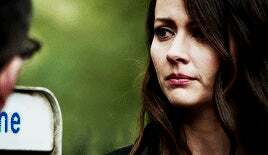 Rather than John's badge, what gets the sleazy sheriff to help out is Root flirting with him (anything for Shaw). It turns out the actual part of the survelliance footage with the truck is corrupted. 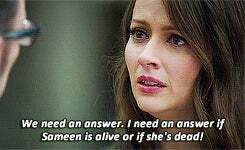 When Root asks to see the backup drives, the sheriff tries to get a date out of it and instead is roughed up and knocked unconscious. While that was going on, John manages to grab a few powerful looking firearms from the sheriff's office. They learn that the truck entered the town but never left, so it looks like they'll be staying the night. John checks them into a B&B while Root drags the bagged sheriff up the stairs. Questioning the sheriff gives them a new lead, a company called Carrow. It seems the town was in trouble, but then this tech company came in, gave everyone jobs and things were great. But then things started to go not so great. People who protested or questioned Carrow would turn up missing, dead, or broke. So the two decide to grab the mayor lady "in charge" of the company (thanks for the correction note, Chitwood15) and see what she knows. 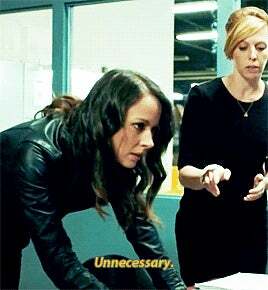 And once again, Reese and Root get to play "bad cop, scary cop". 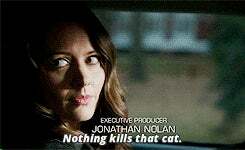 Using a power drill, Root is able to scare some info out of her, including that she saw Shaw being taken into the Carrow building, and that she just does what she's told because she doesn't want to die. The two quickly figure out that Carrow is Samaritan, and it's basically running a live experiment to see how people work, because it hasn't had someone like Finch to teach it like The Machine did. 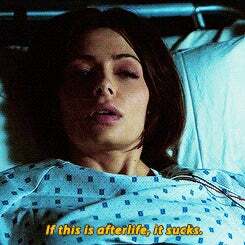 So first it provides them all with a perfect life, then it starts to see how they handle it when things go bad. Root also thanks the lady with a drill through the hand. Their other lead is a doctor, who it turns out was called for over the phone surgery advice. He was set up by Samaritan for malpractice after daring to question Carrow. 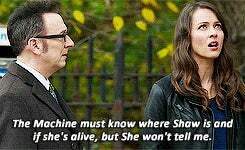 This info leads Root and Reese to believe Shaw is still alive and being held in Carrow. 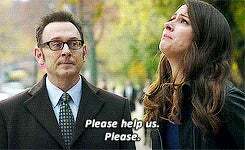 Lucky for them, the mayor can get them in, and Root does her thing (the other one). They discover that Samaritan has been creating tracking devices, including ones that can be implanted. 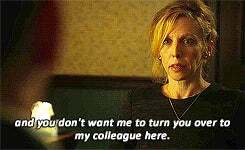 The mayor also mentions a blonde woman who had told her what to do, probably Samaritan's main operative Martine. They also find someone on an operating table, but it's another woman who was shot at the stock exchange. 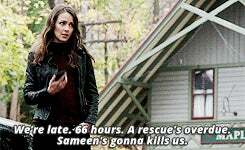 She gets saved, and the two leave, still unsure of Shaw's fate. 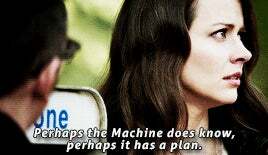 Root doesn't want to give up, but The Machine seems to want her to, at least for now. They get a call from a nearby payphone, and are given the letters spelling out "stop". She really is alive!!!! 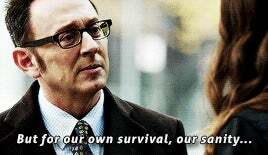 She's being held captive by Greer, but on the plus side it seems they treated all her wounds, which means she could eventually escape and then go into hiding until such time as it doesn't put the team in danger (and Sarah Shahi can come back to work after having her twins and maybe the production team can provide daycare). 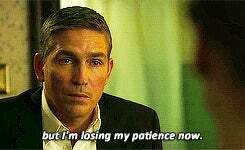 Meanwhile, while all this was going on, Finch pays Fusco (who's also anxious to know if they've found Sameen) a visit at the precinct and gives him a new number. A man who is in town visiting his young niece and seems like a regular shmuck about to get killed. 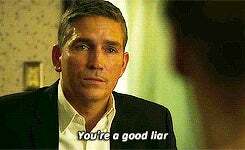 Then Fusco notices former IA Dani Silva watching him, and after teaming up they find out he's actually a hitman, and a very successful one at that, having taken out several witnesses to upcoming trials. They then thwart his current assignment and eventually apprehend him. By which I mean, he's been caught but then tries to go out shooting and is promptly killed. Case closed. It was actually a pretty good side story. Lately, the numbers have all been potential victims, so it was good to get a reminder that it can be victim or prepretrator. And it's good to see Fusco get to just do some regular police work. Sort of. He still gets phone call info from Finch, and Silva is also doing this off the books. Notes/thoughts: seeing Shaw alive at the end was the best. Update: Thanks for mainpaging this, Charlie Jane!